Any car crash is frightening, but a trucking accident involving an 18-wheeler or commercial towing vehicle can have devastating repercussions. The sheer size, weight and ease of which the driver can lose control of these large trucks makes them deadly in a crash. In addition to the excess damage to your car, you and your passengers are at great risk of sustaining massive injuries, including those types of injuries that are not evident until long after the accident has occurred. Since 1992, trucking accidents have increased by 10%, and now happen nearly 11 times a day. These trucking accidents kill 4000 people a year, and an additional 100,000 drivers and passengers are injured annually. Given the large size of commercial trucks, the lengthy hours that drivers are on the road, and the failure of some drivers to abide by the speed limits in order to meet their deadlines, these increasing crash statistics are not wholly surprising. In the aftermath of an accident, victims can be left confused, scared and traumatized. If you or a loved one have been involved in a car accident involving a semi, 18-wheeler or any other commercial vehicle, you have rights,and help is immediately available to you. 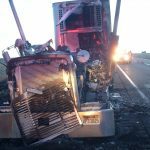 However, if you or a loved one have been in a trucking accident, you may find that despite the obvious risks, trucking companies are less than willing to compensate you for injuries and damages. You need acclaimed and aggressive truck accident lawyers to represent your interests following the accident. While many attorneys claim to handle truck accident cases, at The Mann Law Firm, our knowledge of California and national trucking laws, as well as the regulations that trucking companies must follow to keep the public safe, has produced a long line of victories for our clients who have been injured in trucking accidents. Most recently we have won 3.5 million for a client in a jury verdict against the trucking company who has held responsible for the accident, after a poorly-maintained truck in their fleet caught fire and the driver was burned to death in the cab. Additionally, our attorneys successfully negotiated 2.5 million to the family of a 17 year old killed in a trucking accident. Blind Spots: The larger the truck, the larger the blind spot. Swinging/Wide Turns: When a truck has tried to turn right, thereby pushing you between it and the curb. These can be highly damaging and dangerous. Overweight/Overloaded: The driver has much less control over the truck when it is overloaded. This can in turn cause the truck to lose balance, tires to blow out or debris to fall onto the road due to improper constraint. Braking Ability: Without properly assessing distance and the traction of the brakes, a truck driver could easily cause rear-ended collisions. Driver Fatigue: Due to the nature of the job, truck drivers are often rushed and pressured to arrive at a specific location at a specific time. A driver that loses concentration even slightly puts you at risk. If you, or someone you love, has suffered injuries from a trucking accident, call us today for a free assessment of your eligibility for damages. Our attorneys will help you gather evidence, understand the applicable laws, and present your lawsuit against those responsible. Call (408) 287-1600 to schedule your free consultation today.